If you're a parent of a toddler-preschool aged child, you're likely asked a gazillion questions in a 24 hour period: why?, how?, but how come?, and then what?, but why?, what's in there?, can I?, please??? Sigh. We shouldn't complain, though. It's amazing to have an inquisitive, curious child. And I can't really be surprised if my kids ask me thousands of questions -- I was the same way, and still am. I'm proud to be raising critical thinkers and little girls who question. As you know, I have partnered with Hasbro to unveil the newest Disney Princesses out on the market. 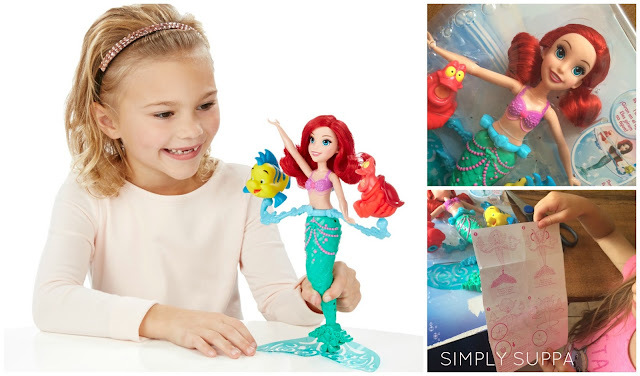 Each Princess has her own quality and this month's Princess is Princess Ariel. Of course, Princess Ariel was as curious as they come. She needed to know what life was life on land -- so much so that she got into a little bit of trouble along the way. But in addition to her curiosity, she was resilient and determined -- all fine qualities. Hasbro has an entire Ariel line -- complete with a beautiful Ariel doll with her silky red hair. Princess Ariel is not a mermaid, but a young lady in her ombre gown. Also part of the collection is Spin & Swim Ariel. This Ariel can be taken into the bath, or in our case, the water table. She comes with friends Sebastian and Flouder, who attach to a blue wave. Spin the seashell on Ariel's back and watch them all twirl together. Instructions are provided. Isabelle was just as happy to play with Ariel and her buddies separately as she was to make them spin. Spin & Swin Ariel has a beautiful translucent green tail. Isabelle is also a huge fan of Ariel's Water Playset. The set comes with a mini Ariel and Sebastian and can certainly be enjoyed in water or on land. (Isabelle didn't want to wet Ariel's castle so I wasn't going to fight!) She set it up on our kitchen table and played quietly for an entire hour. Perfect for her little creative and curious mind. The Hasbro Disney collection is available at all major toy stores, but if you're a Simply Suppa reader, you're in luck! Enter the Rafflecopter below to win this month's featured Princess Prize Pack! 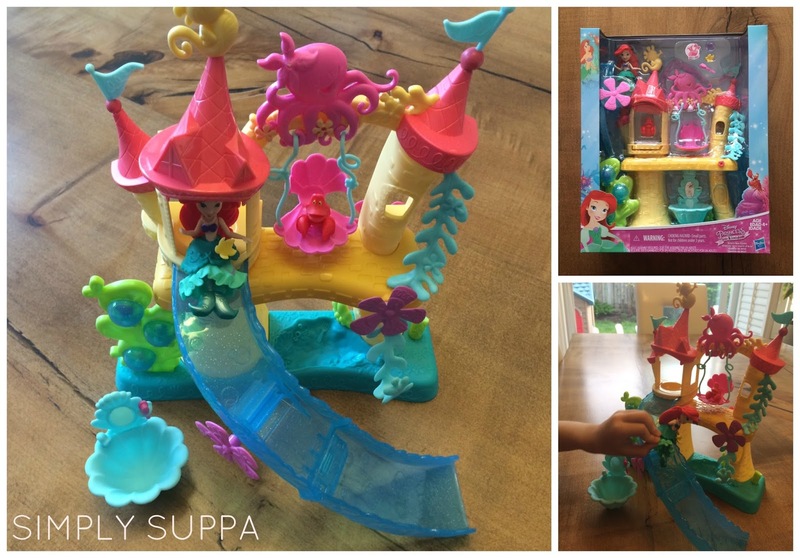 Disclaimer: I am a Hasbro Disney Princess Ambassador and have received products for review in order to write this post. As always, all opinions expressed on my blog are my own. my niece was named after ariel, the little mermaid, so I am partial to her as my fave! My daughters have a great love for Belle. I'm not exactly sure why though. I think they're happy that everything worked out in the end. My 6-year-old daughter loves Tatiana. I don't really know why. Her favourite colour is pink not green so it can't be that. My daughters favourite is Cinderella because she is pretty and nice. My granddaughter favourite Disney princess is Elsa from Frozen. Ariel has always been my FAVOURITE disney princess!! Little Mermaid has been watched over and over in my house that even my husband is starting to remember all the words! (Yes we watched it even for Valentine's Day). We've had VHS, DVD and BlueRay versions of the movie as well as even digital copies. BEST MOVIE EVER! Love the music and how curious Ariel is! My boys don't have a favourite, but my friend's daughter absolutely loves Ariel and everything little mermaid. This would be perfect for her. Thanks for the chance. My granddaughter loves Ariel she watches her movie all the time. Rupenzel because she is pretty and has a cool pet. Ariel is our favourite because she was our daughter's fave and now Ariel is her daughter's fave! My daughter likes Belle because she cares about others. My daughters favourite is Ariel because she also has red hair! My girls love Rapunzel; I am sure it is because of her hair! My daughter's favourite princess is Ariel! She's 3 & she's obsessed with all things mermaid. She loves Ariel because she swims! My niece loves Mulan because she's strong and tough.